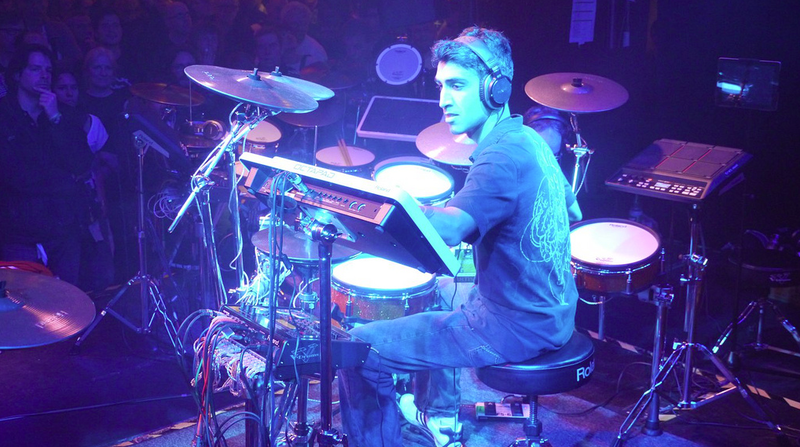 During the recent 2013 Musikmesse music fair in Frankfurt, Germany, Roland held the international finals for the V-Drums World Championship 2. From a field of top drummers representing 16 different countries, Issah Contractor from Canada grabbed the crown with a masterful performance blending impressive drumming chops and a thorough command of the modern technology in Roland’s electronic percussion products. Roland’s annual V-Drums World Championship gives drummers everywhere a unique opportunity to showcase their skills and compete against other Roland electronic percussion players. This year’s contest was the biggest yet, with nearly 5,000 participants competing during national preliminary rounds in countries around the world. The grand finale took place on April 11, 2013 at the prestigious Südbahnhof music club in Frankfurt, with well-known German drummer Dirk Brand serving as the host for the evening. The event was also streamed live to Internet viewers around the globe on the V-Drums World Championship international website. The night featured inspired drumming by players from the United States, Sweden, Italy, Mexico, Hungary, Switzerland, China, Turkey, Brazil, the Netherlands, Japan, United Kingdom, Russia, Germany, Spain, and Canada. Each earned a trip to the finals by winning national V-Drums competitions in their home countries. In Frankfurt, every finalist played an original drum performance using the TD-30KV V-Pro® Series V-Drums, OCTAPAD® SPD-30 Percussion Pad, and SPD-SX Sampling Pad. A group of seven judges assembled for the finals included noted drummers Brand, Craig Blundell, Tommy Snyder, and Florian Alexandru-Zorn, plus music journalists Mark Van Schaik, Rich Chamberlain, and Axel Mikolajczak. They scored the contestants’ performances in areas of technique, style, stage presence, overall creativity, and creative use of technology. Naming a winner was a tough call, as all the players delivered jaw-dropping displays of drumming prowess. When the smoke had cleared, Issah Contractor came out on top with a performance that featured looping on the SPD-30, sample playback from the SPD-SX, multiple meter shifts, impressive double-kick chops, and unique playing of melodies with the V-Drums’ pads. Second Place went to Jaime Edwin de la Rosa from Mexico, while Third Place went to Lars Nijman from the Netherlands. If you’re a drummer based in the United States and want to enter for the V-Drums World Championship 3, check the V-Drums contest page at RolandUS.com. Check out our V-Drums World Championship 2 playlist on YouTube to see final performances from all the contestants, plus interviews with the top three players. Do you agree with the judges? Tell us who you think the winner should be. Congratulations to everyone that made it to this level. All of you are very blessed with Talent.